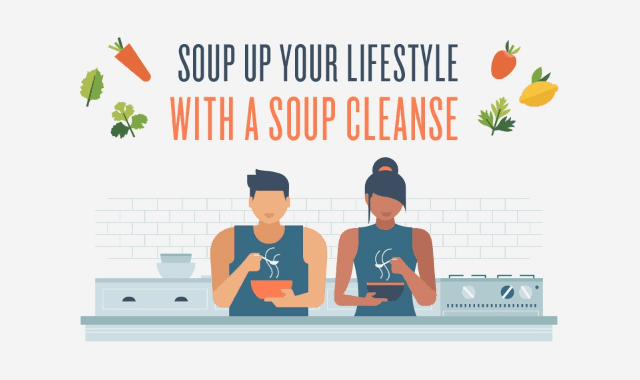 Soup Up Your Lifestyle With a Soup Cleanse #Infographic ~ Visualistan '+g+"
If the idea of a juice cleanse leaves you feeling panicked—and hungry—a soup cleanse may be more your speed. Switching to soup for one meal or all meals for a set number of days may help you reset, get back on track, and eat more mindfully. Compared to juice, soup typically contains more protein and fiber (and a heck of a lot less sugar). Read on to learn more about soup cleanses and their potential benefits plus some tasty recipes.